The cost of energy resources used to power our electricity grid changes by the day. The purchase price of coal, natural gas, wind, and solar is influenced by everything from federal and state policy decisions to international trade restrictions. However, the actual price for customers purchasing electricity from their utility is somewhat measured by how efficiently they use it (and a myriad of other factors). When there is an abundance of inefficiency in the market, utilities need to find and/or build additional resources to meet market demand. This inefficiency is something we are working on. By lowering customer demand for energy (by implementing energy efficiency measures) a utility company doesn’t have to supply as much and therefore can consider that energy a saved resource. Human behavior impacting energy demand is hard to change, especially when it seems as though all material objects made these days require a power source. Advances made in LED lighting technology, however, generate a lower energy demand for a common necessity amongst utility customers. Lighting in the US represents up to 7% of all electricity consumed and is responsible for an even greater 17% of electricity consumed in commercial buildings. This is a golden opportunity for utility rebate programs to purchase energy efficiency as a resource by incentivizing their customers to upgrade their lighting fixtures. The Environmental Protection Agency’s ENERGY STAR program has played an authoritative role in qualifying certain products and appliances as energy efficient. However, the program’s QPL is designed to primarily benchmark energy efficiency at a residential level. The authority qualifying energy-efficient lighting technology at the commercial level is the DesignLights Consortium or DLC. In 2018, the DLC solid-state lighting QPL has grown to over 300,000 commercial lighting products that are now 50% more efficient than just five years ago. There are over 6,500 utility rebates available on DLC qualified products in the US from 240 different utility programs active in 2018. Since commercial lighting fixtures come at a higher price than residential lighting, the utility rebates available on the qualified fixtures do as well. The average prescriptive utility rebate on DLC products is now nearly $80. 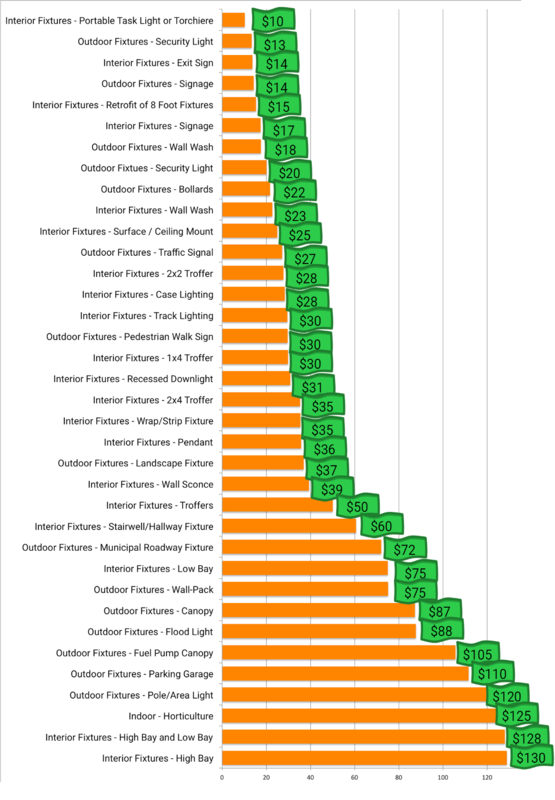 Average Rebate Values on all Lighting Fixtures. With a diverse selection of commercial lighting fixtures listed on the DLC, utility companies have a lot to choose from when designing a rebate program. From the data analyzed using Rebate Bus, it is clear to see how rebates on High Bay and Low Bay fixtures are the most commonly offered utility rebates for commercial lighting. The average utility rebate on High Bay and Low Bay fixtures is nearly $120, that’s 50% more than the average DLC rebate. Also to note about 2018 is the growing attention given to qualifying and incentivizing lighting used for horticulture. There are now 4 active utility rebate programs in Rebate Bus that have incentives for energy efficient grow lights. The average rebate value is at $125, which is considerably high compared with all other forms of lighting rebates. There is a good reason for these high rebate values on horticulture lighting, and that is the legalization of growing cannabis. It was reported in 2015 that 45% of the growth in Denver, Colorado’s power growth came from its booming legal cannabis industry. Now three of the four programs with horticulture rebates come from utility programs in Colorado. For numerous utilities nationwide, horticulture lighting is quickly representing the largest portion of the load of electricity demanded. Utility programs don’t have enough QPL data as of yet to design utility rebates for more energy efficient fixtures. However, the DLC is responding to their goal of researching, refining and implementing new categories, technical requirements, and policies for horticultural lighting products by August of 2018.